A few nights ago I had a particularly strange dream. I was in a mall and I was posing as some sort of undercover investigatory agent--whether for the government, a private contractor, or my own needs, I don't think was made clear. But I knew that I was posing as a false version of my true self in order to get to the bottom of something. The place that I was investigating? A food vendor in the mall, something like a pretzel shop or some kind of snack maker. I applied for the job and got it, then went into full spy mode. Even though I wore the emasculating uniform of the pretzel shop (I'll just go with pretzel for expediency here. ), I knew that I was "more" than just a pretzel slinger. And I knew that to fulfill my mission, I needed to get below the shop, to see the seedy underbelly of the shop . . . the basement. Never mind that malls don't have basements (as least that's what YOU think) or that individual vendors in the malls don't have individual basements. In my dream, I needed to get down there because it was there that the evidence I needed was stored. So I found a reason to need to go down there, asked my manager, and he gave the okay. 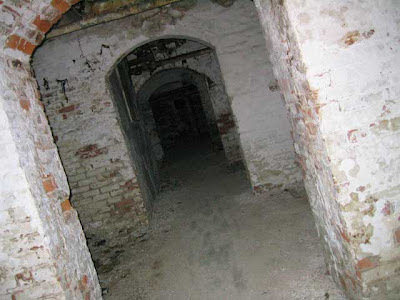 Once I went down the stairs, I saw that the basement was full of storage areas bored into the walls, here and there, also under the flight of stairs leading down from the main floor above. And, of course, it was dark. So I needed a light. So, I need a light. And what do I get to light my way in the mysterious dark? Something like a ferret (that's right, a small, hand-held animal) and the way that you "turn on" the ferret . . . is to bang its furry head against the wall. That somehow makes a light emit from its noggin. So, I'm blundering around in the dank, searching for evidence of some kind, trying to fulfill my covert duty, all the while banging this crazy ferret thing against the wall to keep the light going. I never did find what I was looking for and all I succeeded in doing was giving this fictitious animal a weird sort of concussion.